Dizzy Heights Access Solutions are your dependable companion for everything regarding access needs. We put our customer’s at the heart and our main focus is you as a customer and we will always be steered by your needs and requirements. Our specialist employees have many years of experience and will be more than happy to offer advice on any issues you may encounter, we always make time for our customers. As well as offering an access service, with such a wide and varied set of skills, we can be used as an extension of your workforce. We also undertake large external cleaning tasks, carried out to a very high level, Such as Capital Volkswagen Merthyr Tydfil. 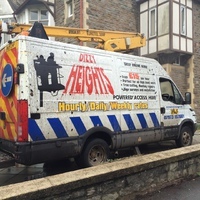 We at Dizzy Heights believe quality and co-operation go hand in hand. Old Bess is our primary vehicle, with great range and mobility we find this to be the best solution in most scenarios. Nissan Cabstar CTE20 - Our brand new edition to the fleet. 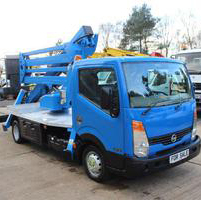 This machine gives a working height of 20 metres, and can be driven on a car licence.